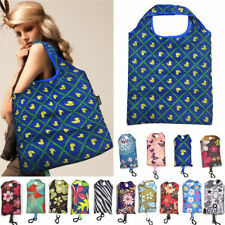 Insulated Groceries Bag Shopping Tote Grab Carry Bag 40 lbs 12" H X 13" X 10" . Canada Rate (item arrived) 0.0% 47. 1 % 31.4% 17.6% 3.9%. Rate (item arrived). United Kingdom. Generous front pocket holds coupons, wallet or cell phone. -Durable handles withstand prolonged use. Size(Height Length Width): 36 45 10cm/14.17 17.72 3.94". Big enough for holding party favors such as candies, snacks, small toys, and more, perfect as gift storage bags for your friends and the kids. We do not know how much they will be. Our price does not include these fees. We'll do our best to help you solve the problems you may have. Color: mixed random colors ( Such as White Black Red Green Blue Rice White Pink Yellow Purple Red wine and so on). Material: Net cloth. As different computers display colors difference, the color of the actual item may vary slightly from the above images. Material: Polyester. Style: Fashion. Weight: 25g. Structure: Cloth Folding. Random pattern flower. Pattern: Flowers. Style : Portable, Continental. Large capacity with foldable to a cute fish shape. 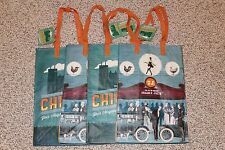 NWT Bloomingdales Big/Medium/little Brown Reusable Bags (3 size bundle)!! Reusable bags are an environmentally friendly way to bring home the items that you get on a shopping trip or to carry items with you on errands. 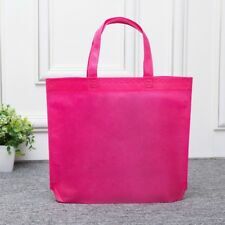 Reusable bags are considered a sustainable alternative to getting new plastic bags to hold the items that you purchase. 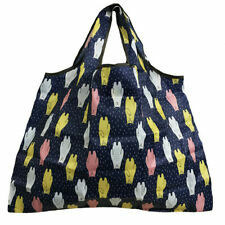 These bags are also referred to as eco bags, reusable shopping bags, bags for life, and recycled totes. What are some options for women's reusable eco bags? Each time you employ reusable bags, you are reducing the amount of waste that goes into landfills. On average, eco bags can be used dozens or even hundreds of times. They come in several different types. Insulation: An insulated tote bag has a special lining to maintain the temperature of the food. Zipper closure: A bag with a zipper closure prevents the contents of the bag from spilling out. The zipper closure is often used on an insulated tote bag to help maintain the temperature of the food. Carrying straps: A bag with straps is easy to carry once it is loaded with items. Reinforced stitching on the straps helps to prevent them from coming off even when they're used to carry heavy things. Attachments for shopping carts: Some totes have magnetic attachments or clips that allow the bags to stay up and open in the shopping cart. That makes it easy for you to count your items to make sure you have enough room in your bags for your items. Machine washable: A machine-washable bag can be sanitized so that bacteria or liquids from food or beverages can be removed. This helps to prevent cross-contamination of the next item put into the tote. How do you choose a reusable eco bag? Select a size: Choose from small to extra-large eco bags with long or short straps. Select a material: Natural and synthetic fibers are available. Select a style: Choose a tote-style bag, a foldable trolley tote with a metal frame, an insulated bag for keeping food hot or cold, or a large market shopping bag with a reinforced base. What are reusable eco bags made of? Reusable bags can be made from a variety of materials. Cotton bags can easily be washed in the washing machine if food residue spills on them. Natural jute is a rugged material for bags and can hold heavy items such as laundry or books. Woven synthetic fibers may also be used in totes. Many bags are made from recycled polypropylene, which is thicker than some other plastics and can be wiped clean with a damp cloth. A nylon or polypropylene carrying strap is usually attached to each side of the tote bag to make it easier to carry.